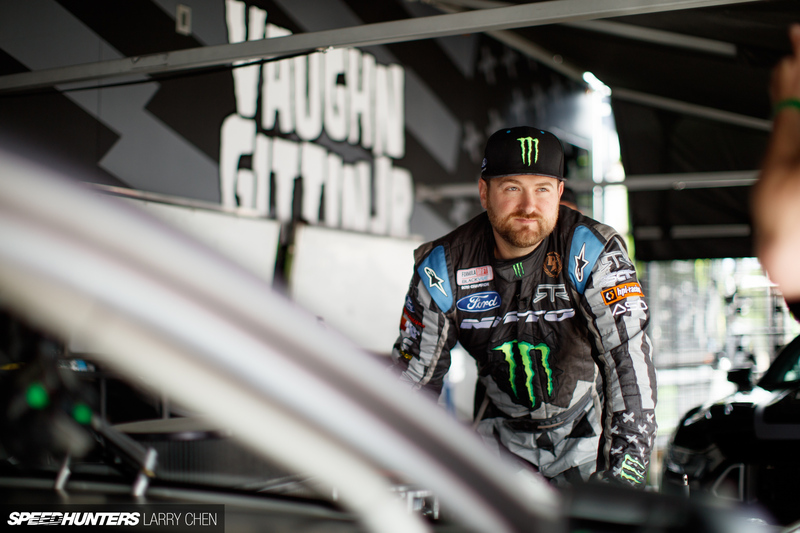 I had a chance to sit down with Vaughn in between practice sessions at Formula Drift Round 3 in Orlando, and go over his brand new competition car. LC: So how did it all start with the new Ford Mustang? 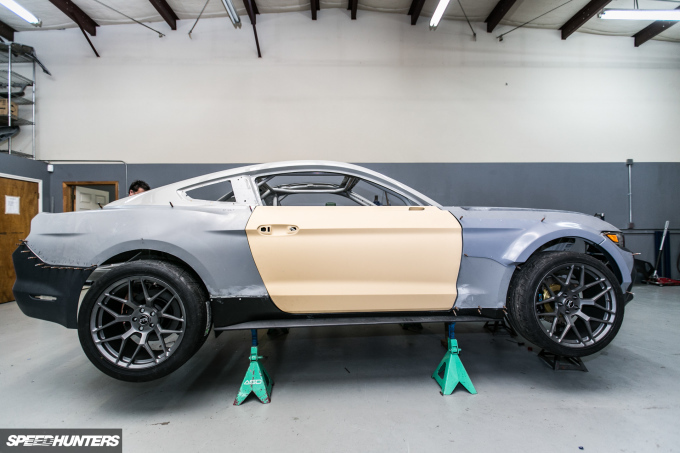 VGJr: In early 2014, when I first saw the brand new S550 Ford Mustang at the Ford Design Center before it was revealed, I was just blown away. 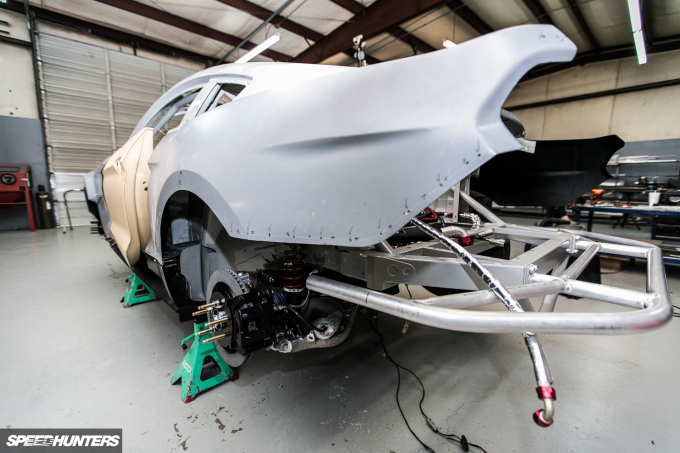 Since Ford was getting rid of the old live axle suspension and going with a brand new redesigned IRS suspension, I was personally super-pumped to build cars for Formula Drift and the street. We’d been driving the same chassis since 2005, and essentially just did a facelift and body changes. It was an awesome car, but everyone was excited for some change. 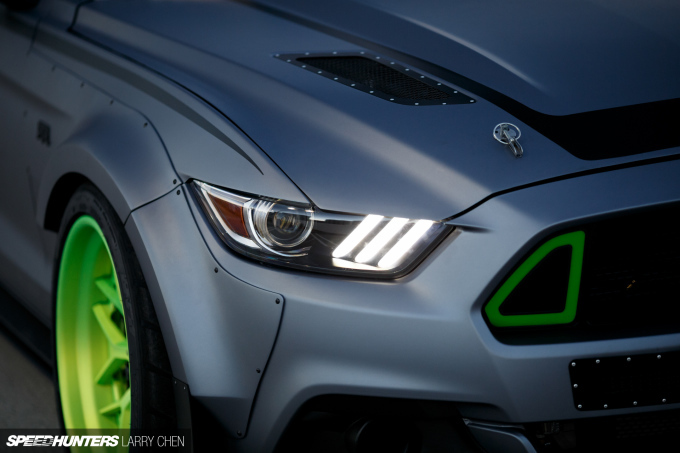 Fortunately for them, this car [the new Ford Mustang] is available globally. LC: Tell me about the steps and your vision for this car. 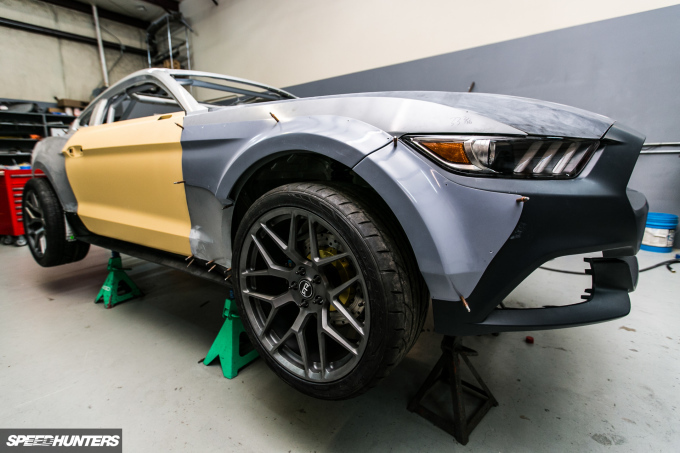 VGJr: We took delivery of a pre-production Ford Mustang along with a body shell in white, in early 2014. The idea was to basically mesh the two into our first development vehicle. So the chassis was fully built at the RTR lab in Charlotte, North Carolina. As many know, I have had a long relationship with ASD [Autosport Dynamics], and with the progression of our respective businesses, it made sense to merge the motorsports program and special projects under RTR, and for ASD Motorsports continue its focus on product development, such as the badass e-brakes it makes. But it’s still the same bunch of crazies behind the walls. 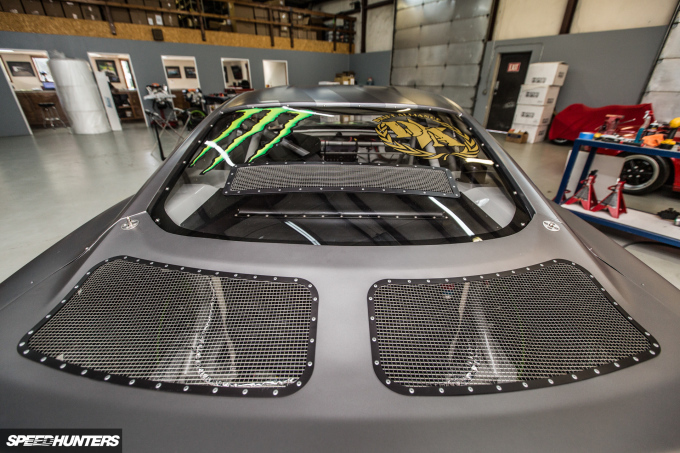 Because we were so busy and focused on what we were doing at the time with other projects, we sent the car up to the great crew at MA Motorsports to do final assembly. 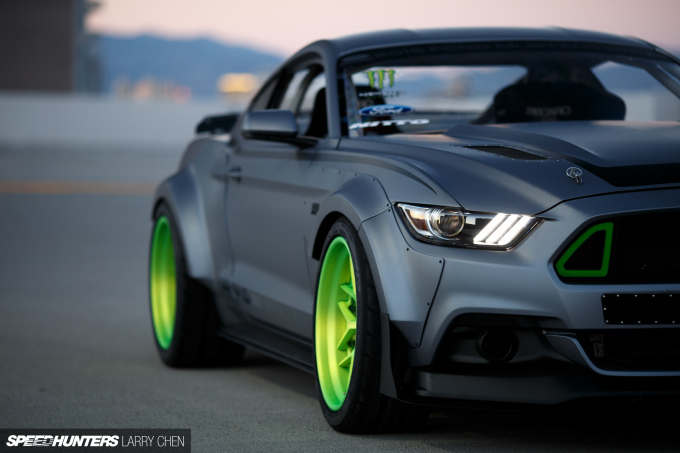 That first car morphed into what everybody knows as the Mustang RTR Spec 5; a car we debuted at SEMA in 2014. It had a Ford Performance 5.0 Aluminator crate motor, Ford Performance transmission, and some slightly modified suspension. 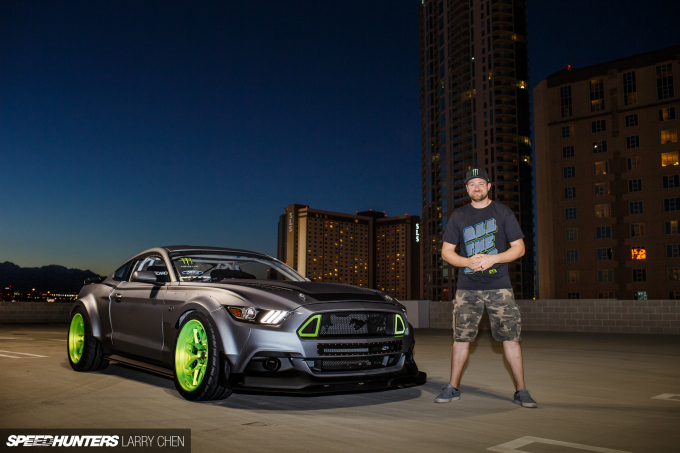 Literally the first time that I ran it out front at SEMA in 2014 was the first time I got to feel a semi-built drift version of the new Mustang. 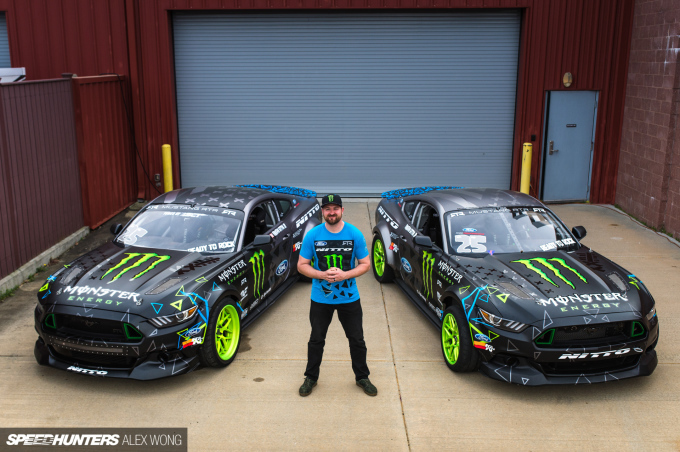 That week was the first time that I ever drove the new Mustang with our proper drivetrain and the next stage of suspension, among other differences from the car we debuted in 2014. 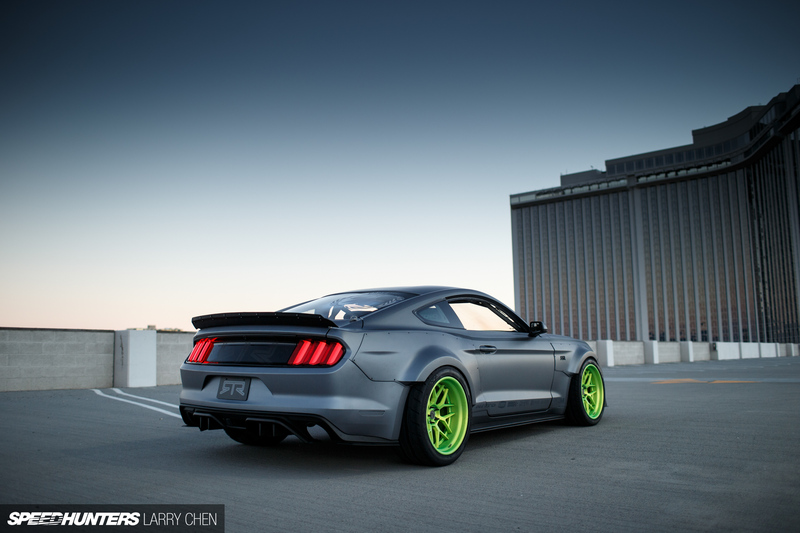 LC: One of the Speedhunters helped in developing the look of the initial one, right? VGJr: The unique thing about the Spec 5 is the wide body, which is one of my favorite things about our current car. We designed everything in-house at RTR, and fortunately we were able to have Keith Charvonia take some of our art and put it into CAD. He actually printed those first pieces for us so that we could get to SEMA in time. 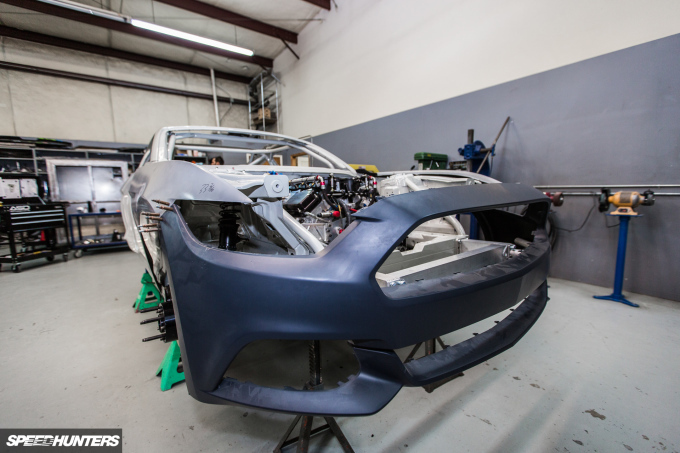 Time was very tight getting the car done and getting it ready for SEMA, like it always is, and Keith was a huge help in getting our RTR wide body panels built. 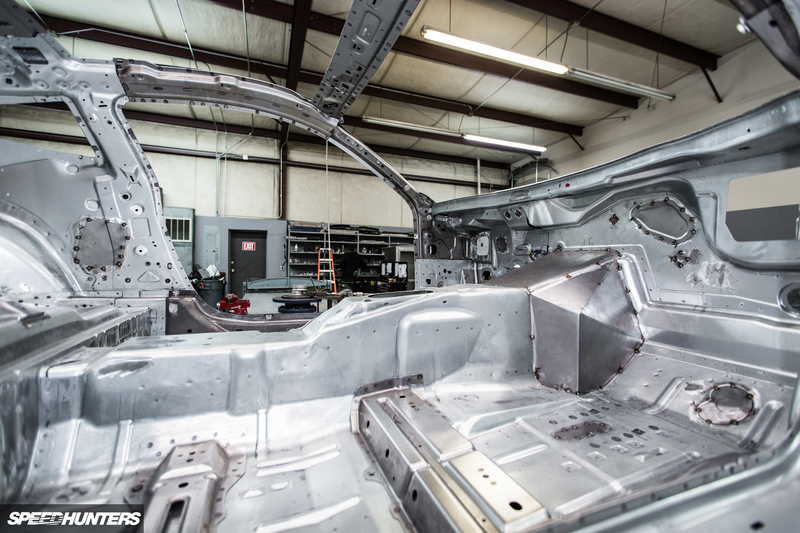 After SEMA 2014 a lot more work went into the car. 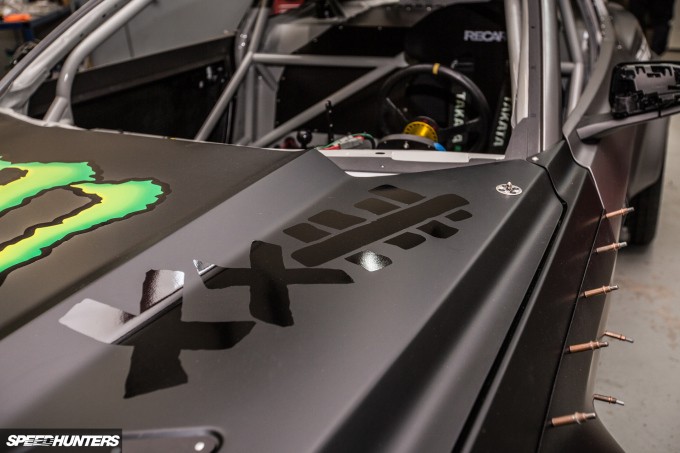 There was computer CAD, moving the suspension around and trying to optimize the all-new IRS within the Formula Drift rule books, and hoping to get it right the first time. Because doing multiple iterations gets very expensive. 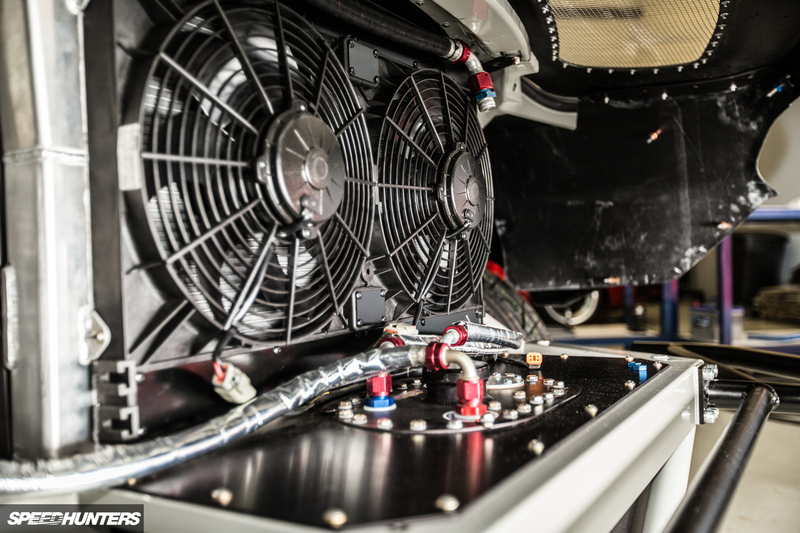 While I was doing demos in the Spec 5 and really starting to get a feel for the car, the guys were in the lab working their butts off building the competition car; we were constantly communicating and trying new things. We ran into some issues with a couple of different iterations, so we were constantly throwing things at it. 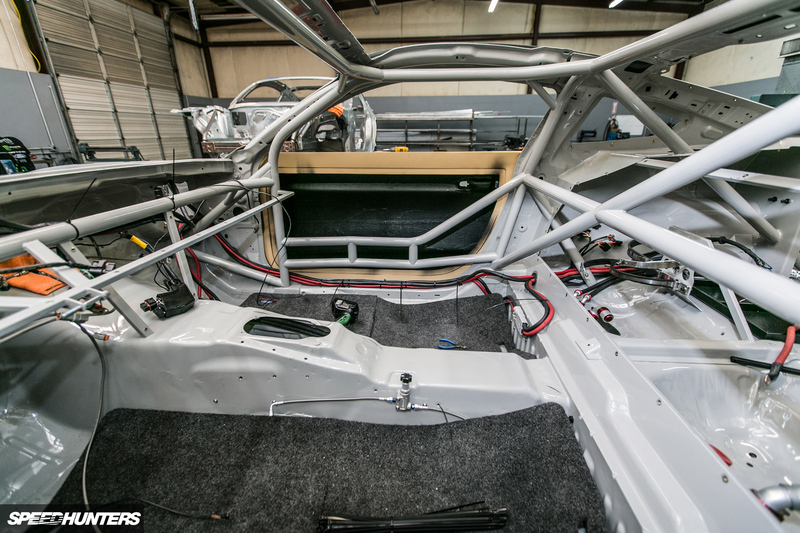 Once we got it dialed and in the box, we locked in all the geometry and what we were going to move forward with for Formula Drift. 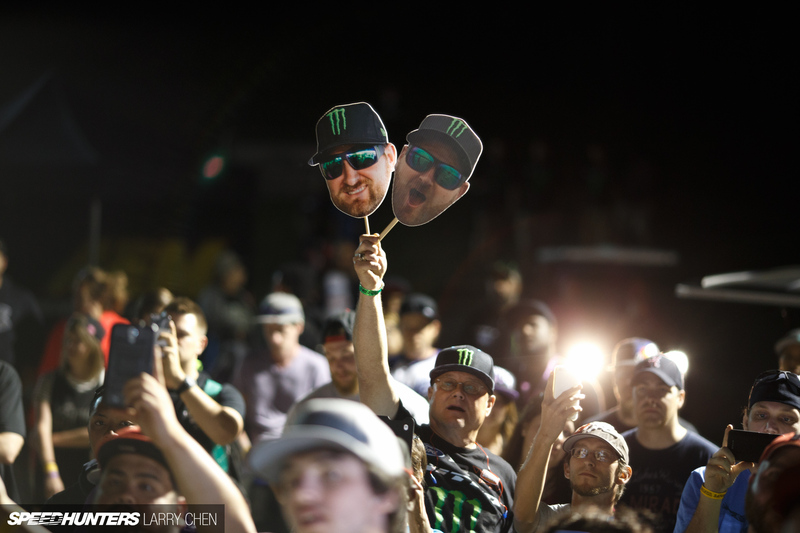 To make a long story really short, the guys worked their asses off all of 2015 in between demos, traveling overseas, and doing Formula Drift. 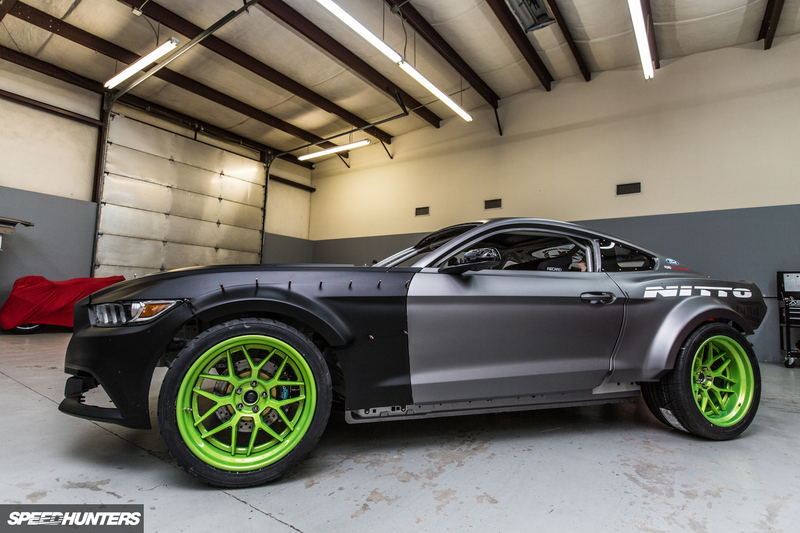 At the end of it all, we had our brand new Monster Energy/Nitto Tire Mustang RTR ready to debut at SEMA 2015 alongside the all-new Ford GT. 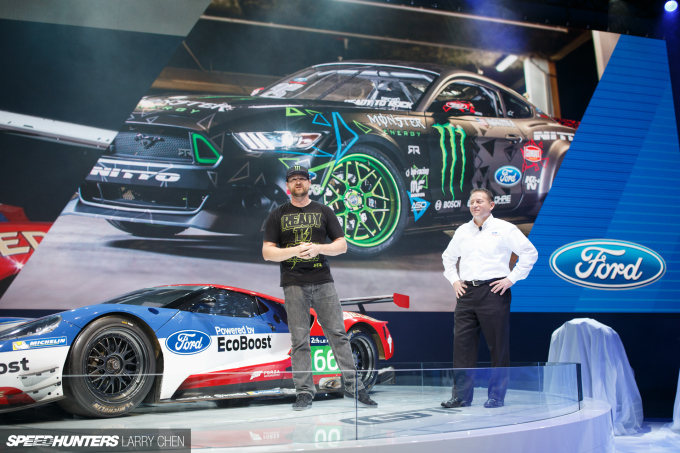 The car and I were introduced by Ford Performance director and all around awesome dude, Dave Pericak. 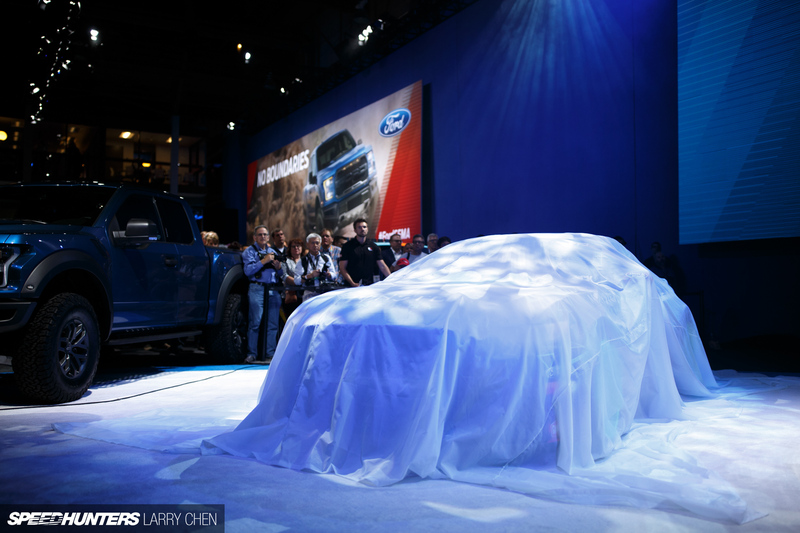 For us, it was a huge honor; for Ford to be proud of what we worked so hard to develop and build – it was just the icing on the cake for all the effort the previous year getting this thing ready. 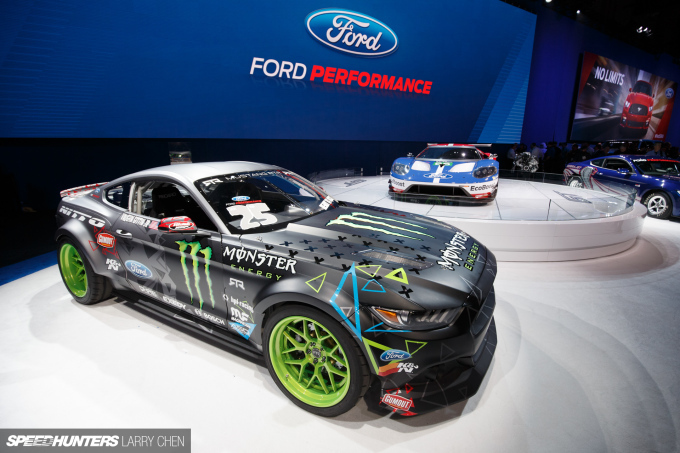 For me, it was really hard to have a competition car that was the old Mustang, and a demo car that was the new Mustang. But we knew we had a lot of development to do and wanted to be prepared when we came out to compete at the top level of drifting, which is Formula Drift. 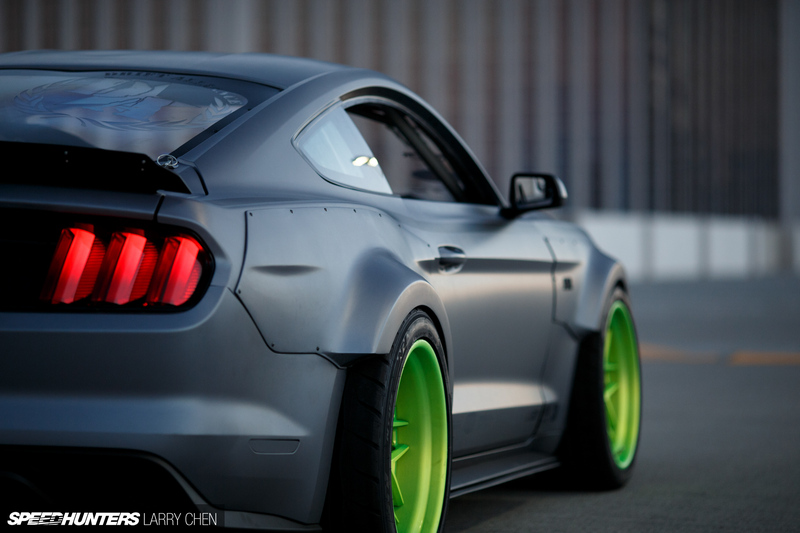 The day after SEMA, we were outside doing drift demos, which also doubled as further development. It was the first time I’d ever driven the new chassis with our proper engine, drivetrain, and quick change [diff] among other things. The work wasn’t over yet, though. 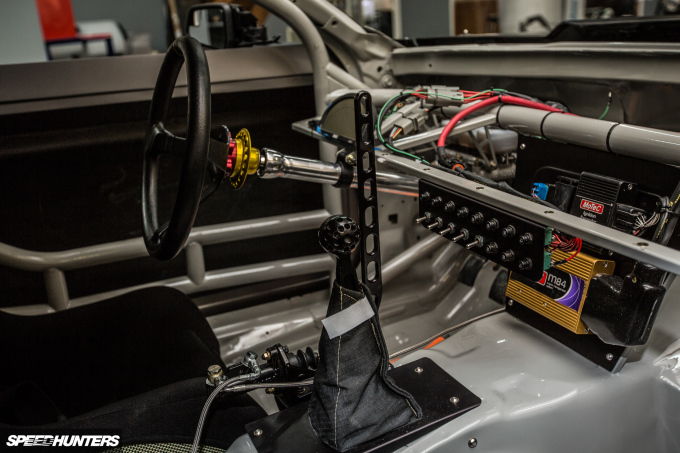 We never had enough time and we used every opportunity to continue developing the car. 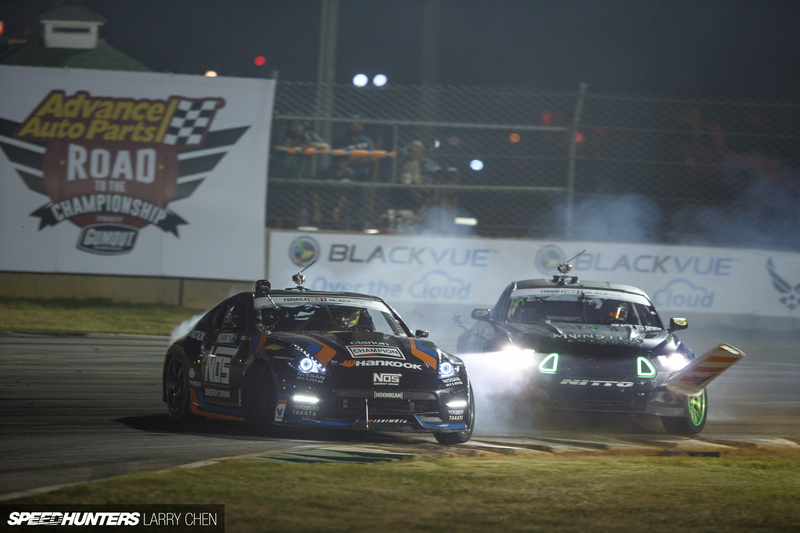 Immediately after SEMA we learned more and made adjustments; we were still testing up until FD Long Beach. 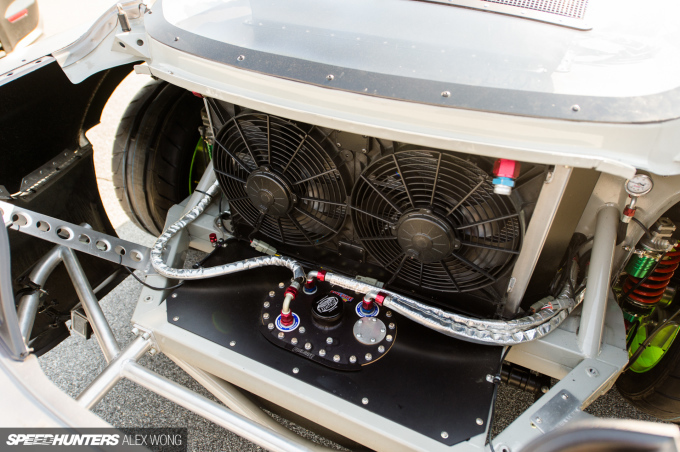 We completed our final test two weeks before Long Beach, and that’s when I realized what we really had on our hands, and how all the effort and patience was going to pay off. LC: Tell us a little bit about how this new car allows you to drive the way you want. VGJr: Formula Drift’s progression over the last few years has forced all drivers to dial in a ton of grip and sometimes drive very scary cars. Our cars have always been very fast and have worked well, but as we got into last year championship, making it competitive also started making it a challenge to drive. With my style attached, it was on a big knife edge. I like to be aggressive and toss the car around, and high-grip setups generally do not reward that style of driving. I had to drive this car the way it wanted to be driven, rather than driving it the way that I liked to drive with my natural style. But I adapted and made it work,because we had to be competitive. When we started off with this new car, I told the team we need more steering angle. I wanted to be able to toss the car around and drive like I used to be able to drive. We knew it was probably going to be a challenge, but after that final test, I just felt reinspired behind the wheel. This new Mustang lets me drive with my natural aggressive style – hard flicks, big angle – and I just feel like I have everything I’ve ever wanted now. Coming to Long Beach, I felt pretty good and comfortable, but at that point I didn’t realize just how hard I could drive it. 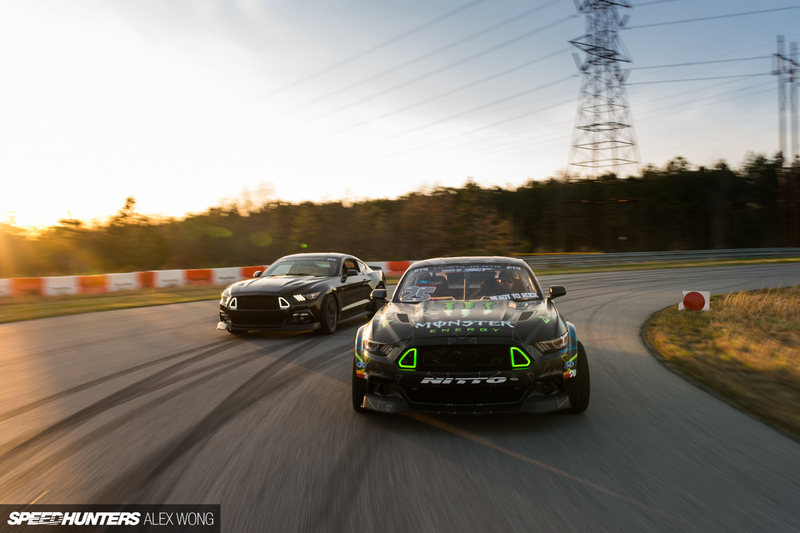 I was still peddling it a little bit like the previous car, but then came Round 2 in Atlanta. We had a perfect event – qualified first and then won. At that moment, I think that I and everybody else in the field realized what we’d built and developed in the last year. I learned a lot about myself and my mental game at that event, but the biggest thing I’m so proud about is doing it for my team. 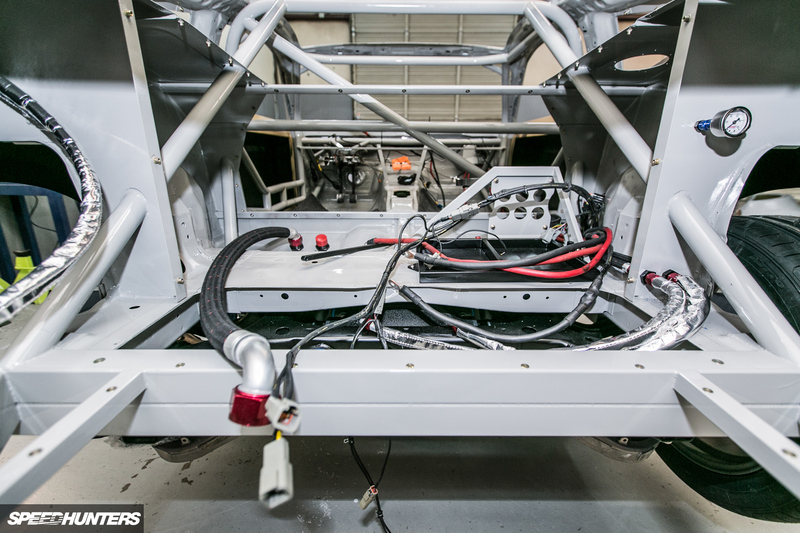 The guys had been busting their butts so hard to get this car ready, and to be able to put it together on just the second event was a huge confidence booster for everybody. We had a rough year in 2015, so to put that behind us and bring out a brand new car and win is something amazing. LC: What’s new with this car? VGJr: The entire car is carbon fiber similar to a Ford GT; light-weighting is something we took very seriously. 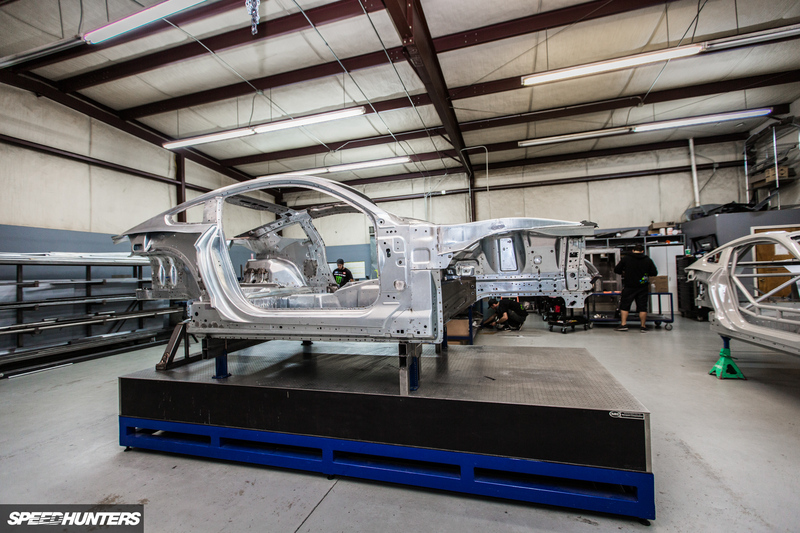 From the factory the car weighs about 3500lbs, and we got it to just under 3000 by doing light-weighting; things you’re seeing manufacturers do. We replaced every panel that you legally could with composite. We cut the steel out of the car as much as we legally could and replaced it with lighter alloys. 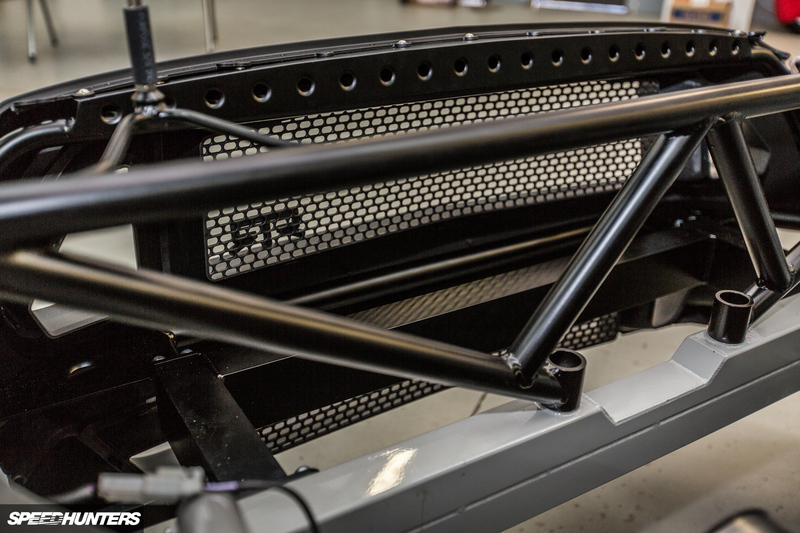 All of the factory steel control arms were replaced with billet control arms. The guys have taken so much time to even cut every bolt so that they are only 1.5 threads after the nut. Light-weighting is the best bang for buck; it helps braking, turning and acceleration all in one swoop. So for us that was a huge focus. 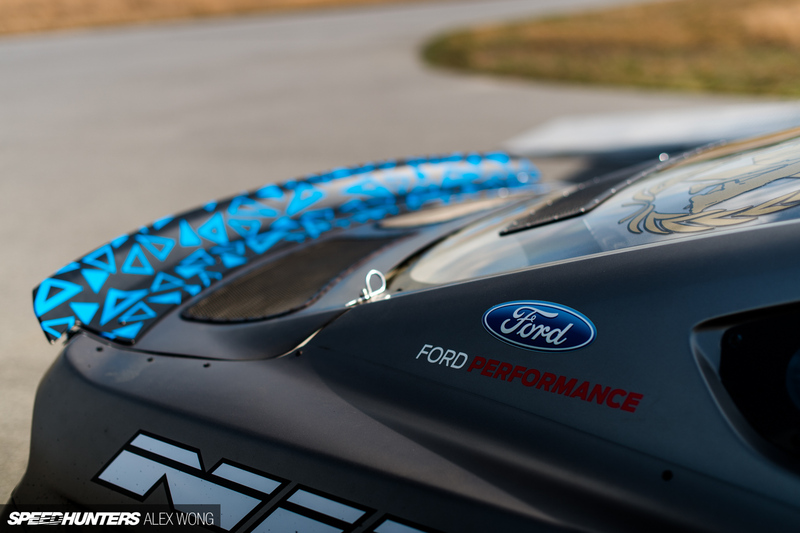 For the motor, we’re using the naturally aspirated Ford Performance, Roush Yates-built 436 cubic V8; we have not found a reliable replacement for displacement just yet. Everybody out here has a ton of power, so it’s crazy to think that we have 900 and we’re at the lower end of what’s in Formula D this year. But the torque makes up for it. If we’re talking about the main differences, that would be significantly more steering angle and the all-new independent suspension. Everybody knows the benefits of being able to have all four wheels working independently of each other, and having that much more adjustability. The one thing that stands out about our car is that it drives on three wheels. In drifting you really don’t steer the front of the car; the only time the front wheels matter are during transitions. 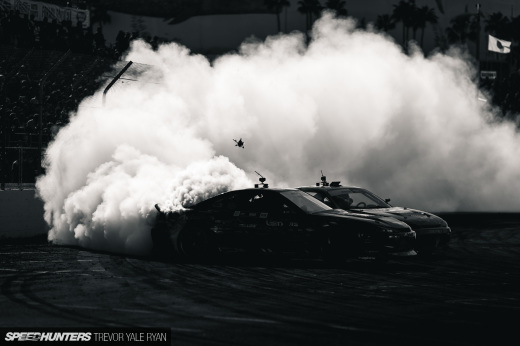 We have a different theory on weight transfer than a lot of people, or what has become the norm in drifting. It’s pretty easy to see that it works similar to a dirt track car. When we’re sideways, the way that we’re transferring the weight is called weight jacking. When you turn the wheel, essentially it lifts the front of the car because it adds so much camber. Then, when I jump on the throttle, that weight transfer puts so much grip down and essentially lifts the front of the car. And because we have so much grip, it carries it. Some people look at it and say ‘Wow, crazy, why would you do that? Put your wheel on the ground.’ It definitely has a couple of compromises, but overall it works really well. This new suspension really likes it and it really doesn’t affect me. 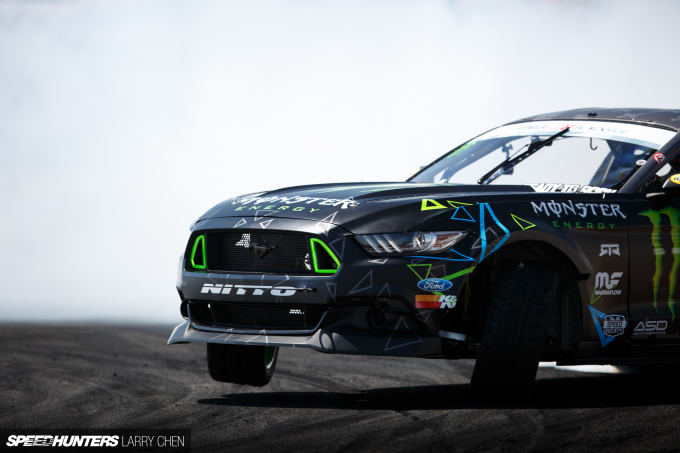 We’ve got super-sticky Nittos up front, and while they’re on four or three wheels it goes where I want it to. 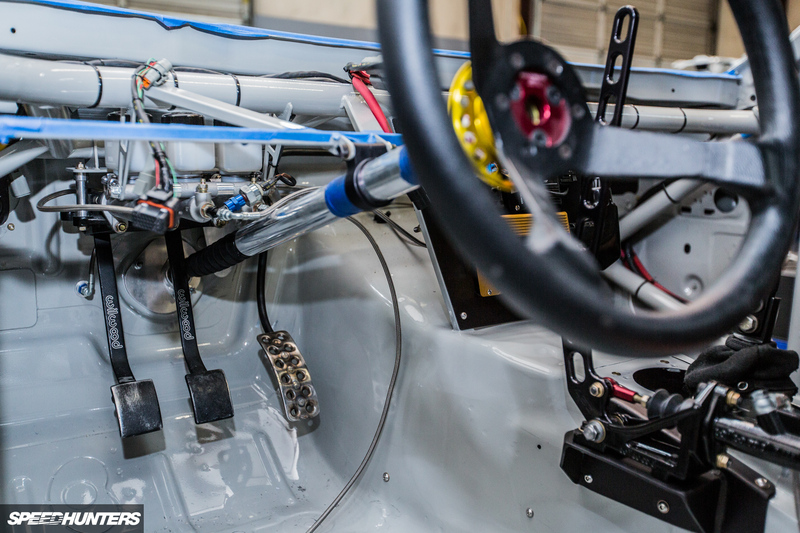 Interesting to see the car still running a single rear caliper and inline handbrake. Amazing computer Computer Aided Design skills Keith! 3) The cf body panels are really cool. The rear end is fun to stare at. I've found that a bit illogical as well (high grip drift cars). I think I heard that the high grip allows for faster drifts with a lot of control. But idk. If you have a low grip setup, your throttle and steering inputs can be larger without upsetting the car too much or affecting your line. Whereas with a high grip setup if you're not completely committed and getting all your inputs right, you'll spin or straighten much easier. To be able to build a high grip setup that you can just throw around comfortably is very impressive. Less stress on the driver which matters when your cabin temp is 120 degrees. NICKCEFFY I don't see any pics of the rear caliper setup but my guess is it's not inline, he probably has a remote reservoir. 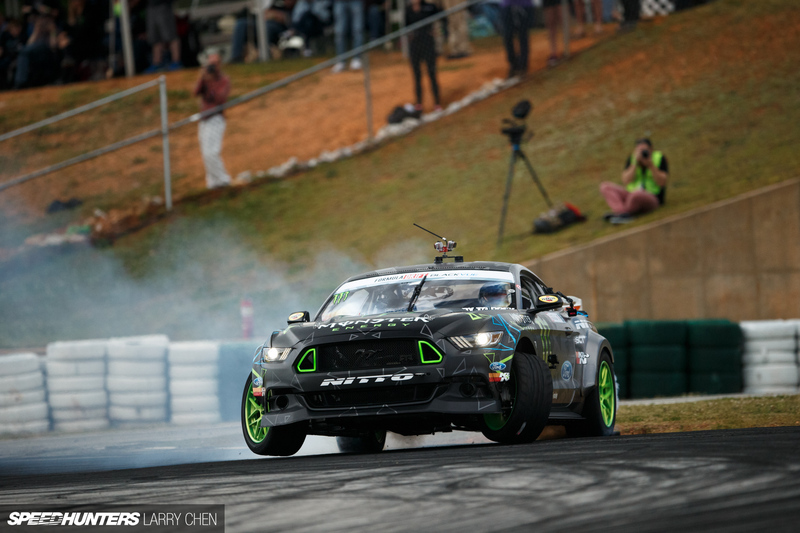 The actual wheels he uses for drifting look like ho cart wheels on that car. To bad he can't drift on the bigger rims. 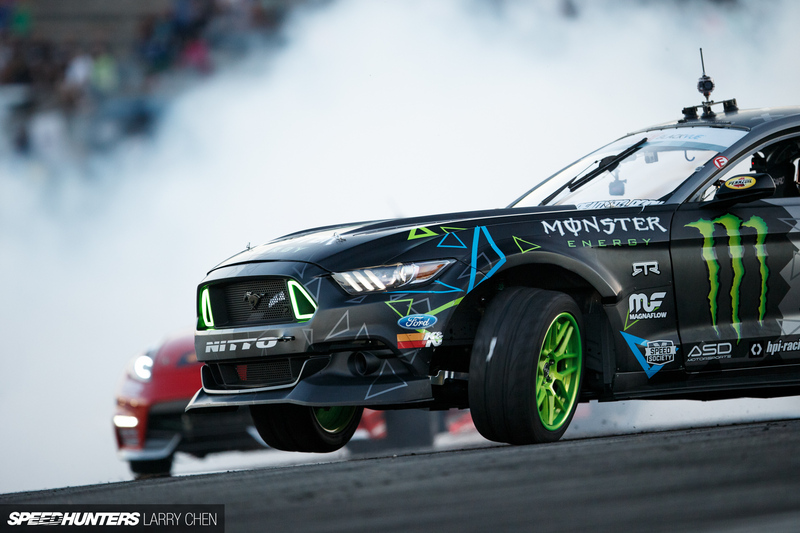 johnbezt Modern drifting is a joke - it's a high horsepower powerslide smoke show. 15, even 10 years ago, drifting still relied heavily on technique, not power, and if you go 20-25 years back, it didn't even matter which wheels supplied said power - FF, FR, AWD - as long as you were sideways and could hold it for considerable amount of time you were golden, drifting WAS fun. JoeTee1 This comment almost made me spill my coffee. lol. Thanks for the laughs. @ryandriftingfat NICKCEFFY Pic 31 might be the key to figuring it out, and the proportioning valve in pic 18. Now I know where I've seen his driving style before, sprint cars! Maybe should head up to Skagit Speedway to see a race this summer. 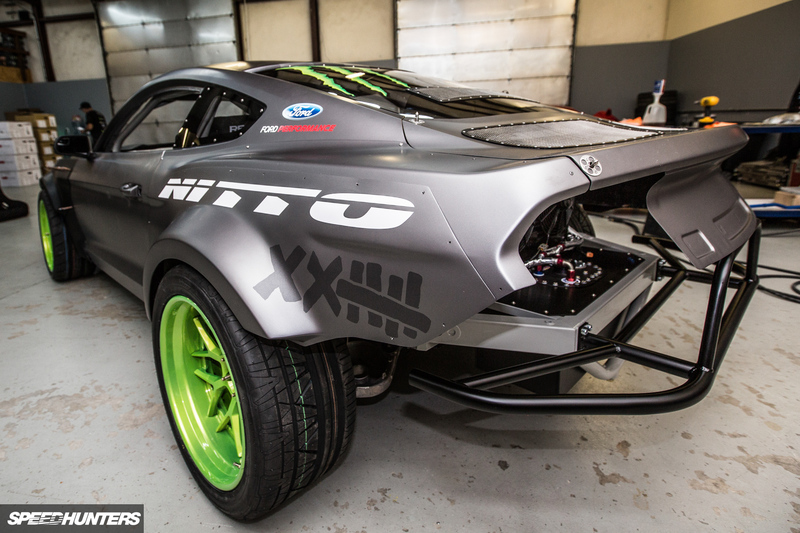 Hmmm... 1,500 lbs and a 1,000hp, ultimate drift machine? Cool article, it's interesting to see the effort that goes into these builds. So much work out into this mustang. It's cool to see, I just wish the comp car looked as good as his demo car . Wheel gap and wheel choice make a huge difference. (I understand why so no need to clear that up for me). On another notes Glad we get an inside look at these cars,it's so crazy to see how far these cars have come in the years. Thanks for the pics and story speedhunters. 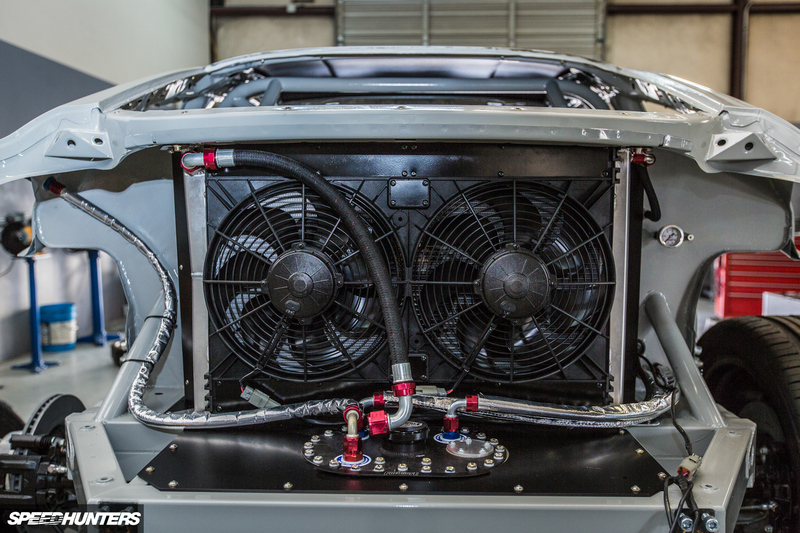 @fabrik8 NICKCEFFY The pics you are referring to are the SEMA demo car as a first iteration prototype. 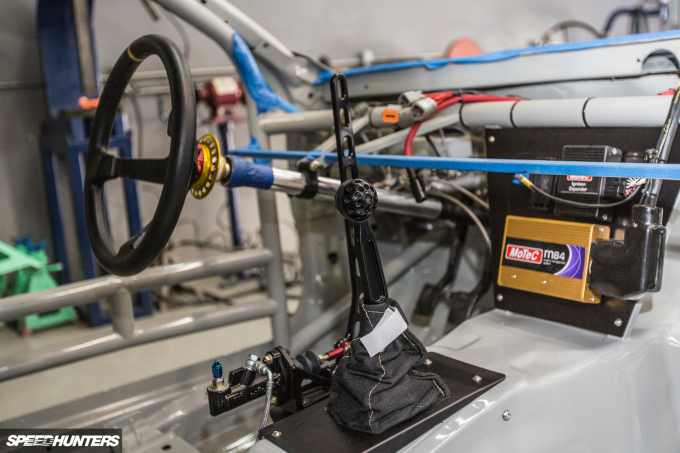 The real race car rear suspension and brakes as used in FD aren't shown in the pics. ASD Motorsports Ah, I figured it was an easy answer like that. Very nice build, I always wonder what's going on behind closed doors whenever I drive past your shop (I'm local). Pooft Lee Yeah, that was something I noticed at FD NJ this weekend (Where coincidentally, this car took 1st place again) was how all the Wisefab FR-S/BRZ's have the wheels sticking out about 3" past the flares in the front and the front track width is about 6" more than the rear. It really looks awful. Pooft Lee its not just the wisefab kit that does it. If you watch any of the FD Japan events, youll notice the same trend. I think its more of a drifting trend now. apex_DNA johnbezt hahahaha, power slide smoke show? Did you watch FD when it first came out? They couldnt even hold a drift through the whole course, that was more power sliding than anything. 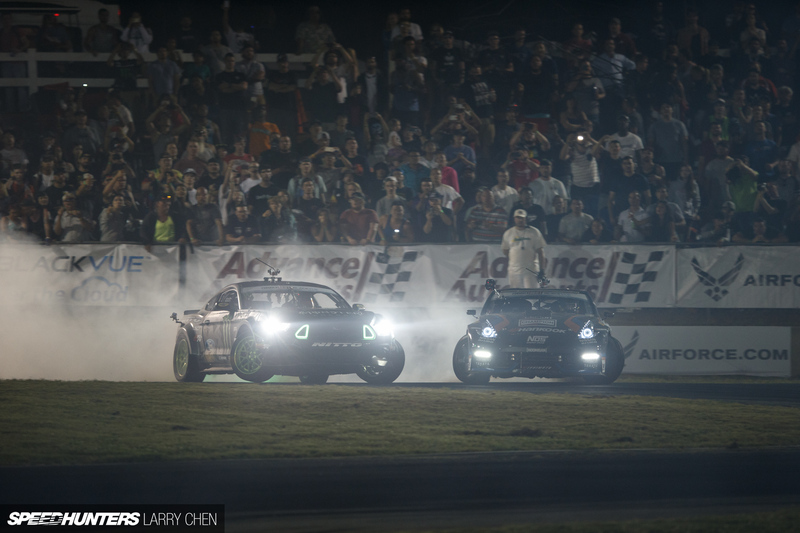 Nowadays its a night and day difference, they actually drift through the whole course. You think its more entertaining to watch a 220hp AE86 drift than a 1000hp car? You sir must be a boring hoity toity old school drift elitist. Watching "a 220hp AE86 drift" IS way more entertaining "than a 1000hp car", why? Because it relies on driver's technique, and not the amount of horsepower (or money to bribe the judges). jdmbucky apex_DNA johnbezt Yes it is. Drift today is drag racing with some corners. That is reason why I adore grassroots.